Boyd Lighting has long been known for luxurious, made-to-order light fixtures that are designed to fit the specs of discriminating clients. 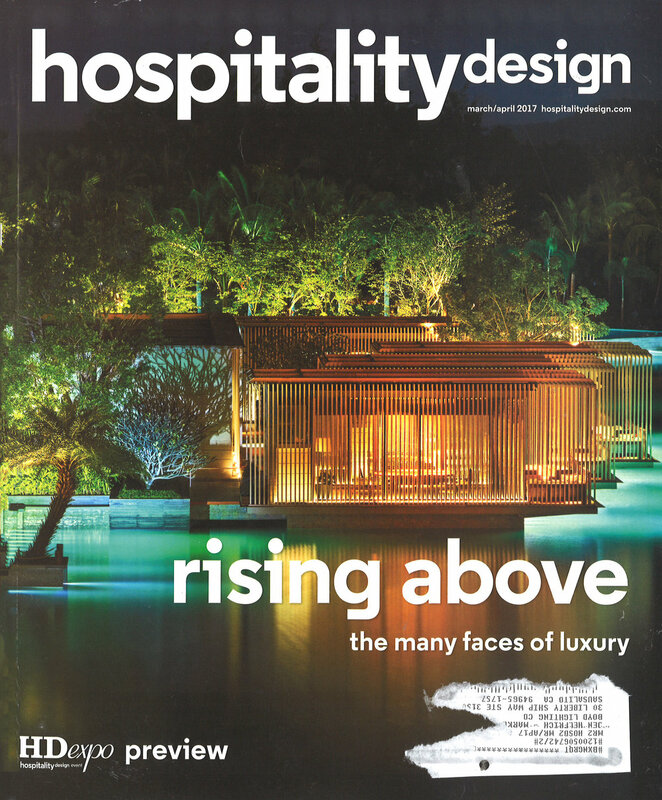 International designer Roger Thomas has for years been using Boyd in massive hospitality projects. Over a decade ago, Thomas came to Boyd to manufacture his lighting designs, and he continues to come back time and time again to use Boyd’s high quality fixtures in his projects. Eight fixtures later, Boyd continues its partnership with Thomas and Wynn. When the stakes are big, designers like Thomas select Boyd for the “luxury” that comes from the superior handmade quality. A fine-tuned attention to detail, the handmade manufacturing process and the resultant superior quality make Boyd fixtures the next generation of antiques. Boyd’s luxury has appeal beyond exquisite, very personal residential projects. The magnificent US $4.1 billion, floral-themed Wynn Palace is scheduled to unveil in Cotai in 2016. Guests are transported into a world of beauty, excitement and entertainment via a breathtaking ride in uniquely themed, air-conditioned SkyCabs that traverse a stunning 8-acre Performance Lake and into the heart of the resort. The second luxurious integrated resort in Macau by Steve Wynn, Chairman and CEO of Wynn Resorts, Limited – following the launch of Wynn Macau in 2006 – Wynn Palace features a 28-storey hotel with 1,700 exquisitely furnished rooms and suites, spectacular, large-scale floral displays, superbly designed gaming spaces, versatile meetings facilities, an opulent spa and salon, renowned luxury retail and gourmet dining outlets. Cotai's Wynn Palace will feature over 3,000 Boyd Lighting fixtures. Soon, 188 Venice Ceiling fixtures in polished nickel and a shocking 2,914 custom LED Ormolu Sconces in polished bronze – both designed by Thomas, of course – will be saying “néih hóu” (hello) in Cotai. Boyd fixtures are designed to last a lifetime and are the smart choice for those investing in interior design. For orders large or small, you can bet on Boyd Lighting. 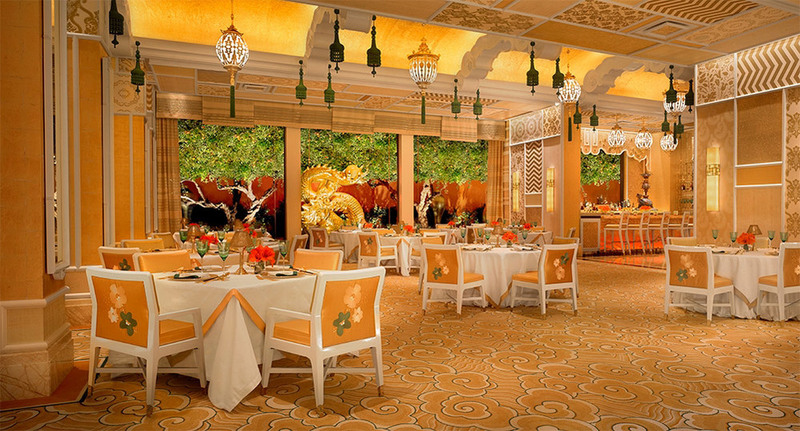 Since this blog post was originally published, the Wynn Palace Cotai has opened! 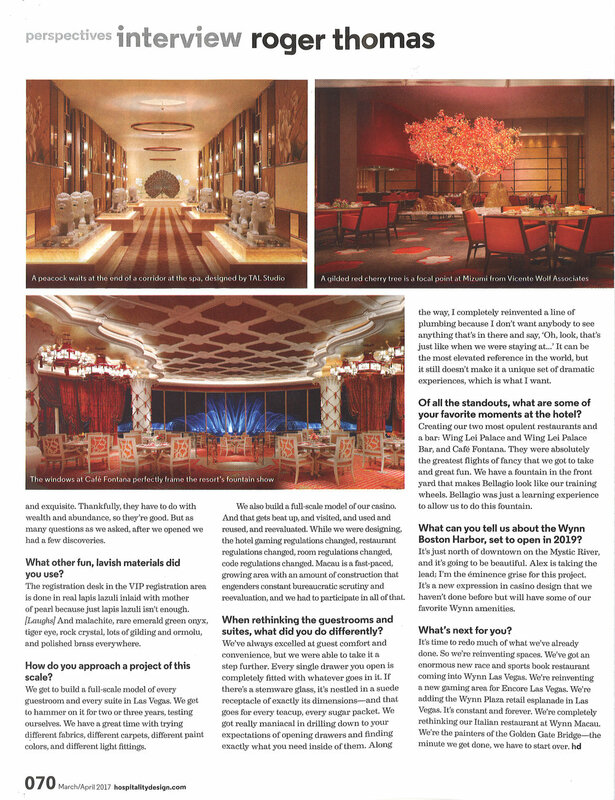 In a Hospitality Design magazine interview published in the March/April 2017 issue, Roger Thomas talks about his use of rock crystal and ormolu (two key elements in the fixtures above), as well as how he approached a project of this scale. Read the full interview below.